Jack Nissan reports as the young people are starting to take ownership of Tinderbox ahead of their first festival show. I have been asked by one of the young musicians from the Tinderbox Orchestra to write an introduction for a new blog that we are starting. It is something of a big moment in this project, and for me personally, as the young musicians who the project was designed for are now starting to take real ownership of it, taking on the jobs and responsibilities required to make it happen and putting forward the ideas that are going to make it grow. And they are doing so with an eagerness and enthusiasm that makes me feel that this little idea we decided to pursue just under a year ago is actually working, and that it might really have the potential to do something worthwhile, novel and exciting with youth music… and hopefully with music too. We are also keen to collaborate across the arts to bring performances and events to life, and hopefully this will also lead to some imaginative and interesting future projects too. 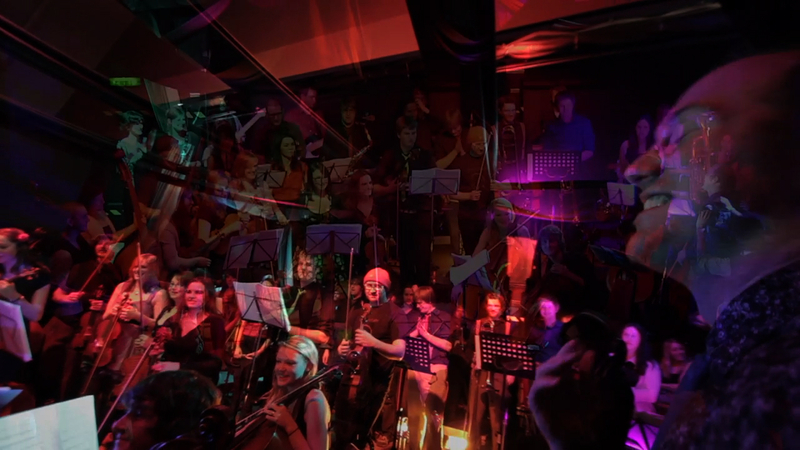 The Tinderbox Orchestra currently stands at a 35 piece band, involving young musicians aged between 13 and 21, plus the tutors who also play in the band. We would love this to grow too. The dream vision is a full on, standing, dancing 100 (or more!) piece orchestra performing awe-inspiringly brilliant original music to a young crowd at venues and festivals that young people would love to play at! We are only just in our second term, but the first concert was definitely on the right lines (see video below) and we’re playing our first music festival this July at the Garden Party at Kelburn Castle, so who knows, we might just get there! For Sunday’s gig, two of the young musicians composed and arranged pieces, and we wrote a group composition altogether (all 35 of us!). We have also just set up a team of young musicians to take on some of the organisational roles involved, and I get the feeling that before long they’ll be running the show themselves! We run 10 week courses during termtimes with weekly rehearsals on Sunday afternoons. While Tinderbox is a youth project, I believe the more ambitious, genuinely creative and high quality it can be as a musical and artistic project in its own right, the more inspiring and educationally worthwhile it will be for young people. As such, we want to set our sights high, continue to encourage the collaborative spirit and youth involvement that has got it this far, and always be open and eager to experiment with new ideas and interesting projects. With so many instruments, so many people, and such a massive palette of sounds, the potential to be creative with music and performance is huge. The question posed to the orchestra at the start of this term was: “What is the most off the wall, ambitious and creative idea you can think of for an orchestra?” I hope we keep asking ourselves these kind of questions as whatever and wherever it is, it is where we want to be! A bit of a mouthful, but essentially the idea is to involve young people in genuinely creative and inspiring contemporary music and arts projects, and to bring them into the exciting scene of professional bands, musicians, film-makers and other artists that underlie Edinburgh’s contemporary arts scene and which make this city tick.